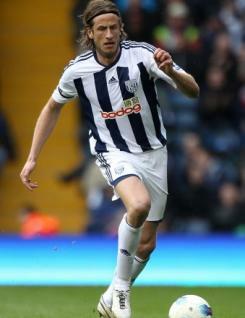 Jonas Olsson is a defender who signed for West Bromwich Albion at the end of the summer 2008 transfer window. A left-sided centre back, he offers great commitment and a towering presence in the heart of the defence. He has been a regular choice since signing for the Baggies, with his only spells of absence coming as a result of injuries. Jonas was again one of the key figures in the Baggies? defence in 2010-11, although he missed a three-month spell in mid-season with an achilles injury. He began his career in Sweden with Landskrona BOIS, then played in the Netherlands for NEC Nijmegen before joining Albion. Jonas won his first full cap for Sweden against Belarus in June 2010.